Did you know that hot food holding cabinets may potentially help cool down your labor costs? It’s true. Human resource management experts widely state that food service businesses’ average labor costs are 30 to 35% of sales. Of course this all depends on the type of food service business. Those that tend to offer fewer services and rely heavily on ready-made, convenience products obviously get to enjoy lower labor costs. But what effect does that have on the customer experience, brand loyalty and the like? If you are at all concerned about marketing, they’re good questions to ask. And in many situations, the answers prove that money saved by reducing services and food quality in the short-term is dwarfed by what’s lost in the long-term. So what’s a food service person supposed to do when labor costs get too high? Bring on hot food holding cabinets made with Fluid® Shelf Technology. They allow schedulers to reduce labor costs without sacrificing food quality, menu variety and services. Plus, they have a positive influence on an establishment’s food costs, food safety, capacity management, holding times and utility bills too. The reason is they are versatile, effective and energy-efficient. For example, a skeleton prep crew can load the hot food holding cabinets up and set the timer to kick off at a certain time. Once the timer goes off, the cabinets will safely slow-cook the food and have it ready when the line cooks arrive. They can then pull perfectly cooked, menu items from the hot food holding cabinets and serve them as needed. At the end of the shift, the buffet pans may be removed from the warmers and safely refrigerated until they are needed again. When they are needed again, the hot food warming cabinets may be used to bring them back up to temp. It’s that simple. The equipment ends up doing all of the heavy lifting instead of the staff. 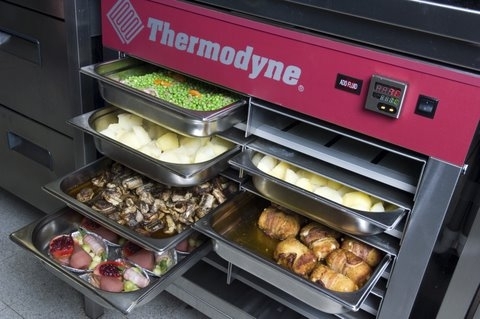 To learn more about using the best kitchen equipment to douse the flames of rising costs, please contact Thermodyne Foodservice Products today.